Ode Street Tribune: Ode Street heading downhill? 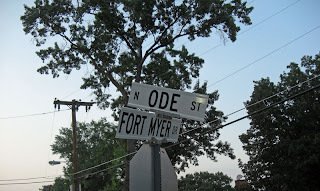 The Ode Street sign has become titled downward. Probably not significant. This has been an ongoing problem for Ode street for the past 3 years. Not sure if there are kids in the neighborhood that continue to rip down the sign, but its been replaced about 5 times in the past 3 years.